Find the wheels that fit your lifestyle. When you’re investing in a wheelchair, it’s essential that you choose the type that will best meet your needs. The main decision you’ll have to make is whether you need a manual or power wheelchair. Wasem’s Pharmacy & Home Medical in Clarkston, WA is here to provide some useful information to help you in this process. You’re well on your way to choosing the wheelchair that’s best for you. Stop by Wasem’s Pharmacy & Home Medical in Clarkston, WA if you have further questions or would like to check out some of our wheelchairs today! Manual wheelchairs are an excellent option for users who can propel themselves forward without excessive effort. 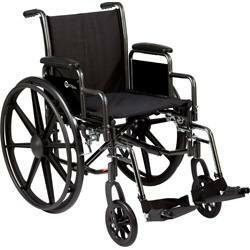 If you suffer from a condition that makes you fatigued or weak then a manual wheelchair may not be the best option. Your speed may be reduced if you have to put forth great effort to use a manual wheelchair. Speed is important for a number of tasks, like crossing the street. Remember that not all terrain is smooth, so extra effort may be required when the surface is not level. There are also areas that might not be easily accessible in a manual wheelchair, like curbs and other obstacles. If you can manage to pop a wheelie to overcome these obstacles, that’s a useful skill for dealing with less accessible areas. Power wheelchairs are often viewed as more efficient than manual wheelchairs due to the lower amount of effort and time required for operation. It may seem like a no-brainer to choose a power wheelchair no matter what your needs might be, but that’s not always the case. Power wheelchairs, too, have accessibility issues. Remember that these machines are extremely heavy and cannot be transported as easily as manual wheelchairs. Many power wheelchairs require an accessible vehicle for transport. If you understand how to use a wheelchair but do not have the strength needed for a manual model then a power model might be the better option.